WARNING: In The Wonder Weeks, full version, all ten leaps are described. This chapter book only describes the 9th leap. The Wonder Weeks, start fussy week 59-63, Wonder Week 64, Leap 9. How to stimulate your toddlers mental development and help him turn this predictable, great, fussy phases into a magical leap forward, describes in easy-to-understand terms the incredible developmental changes that all toddlers go through 64 weeks after the due date (start fussy period at 59-63 weeks). The book is based on the discovery of the phenomenon that all normal, healthy toddlers appear to be more tearful, troublesome, demanding and clingy and have more temper tantrums at very nearly the same ages. Start learning rules now, prevent the terrible two’s! @64 Weeks: (Leap of “Principals”) Begging for Rules and the Start of Science! 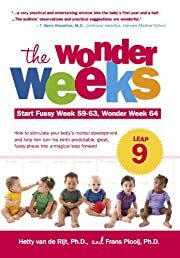 At the ninth leap, around 64 weeks or almost 15 months, your baby changes drastically. Suddenly he is no longer a little baby, but a real toddler. He has a new ability to observe and handle “principles.” Because he has risen above the previous confines of “programs,” he has shed their rigid character. Before this leap of principles, our little helper was still bound by certain strict programs, which tended to be a tad mechanical in nature. Although he had learned what to do to achieve his goal, he always did it in the same sequence. He wasn’t able to adapt to circumstances. That will change after this leap of principles.